Ghost Train Fairground Fortunes slot has a title nearly as long as the tracks needed for this haunted locomotive to sit on. The theme is self explanatory as we visit the fun fair and listen to spooky music appropriate for our trip into the darkness and spin the reels with sounds from the various fairground games like the ring-the-bell hammer. The reels are set against a backdrop of dark tunnel entrances and we have an evil-looking Coconut character loitering at the bottom right of the reels which we will see later. So, is it a game we would happily take a trip with or one we would place next to the tin ducks and fire rifles at? There are only three picture symbols to go with the standard card icons, and the highest is the fairground marquee with the game's title paying 25x bet for 5-of-a-kind. This though appears stacked across all reels and given that we have 20 pay lines over the 5 reels and 3 rows, it would award a decent 500x bet for the full screen. We then have as the remaining picture icons the Ghost and Dodgem Car and Bouncy Castle which pay 20x each. The card icons don't pay too badly either with 10x and 5x respectively for the higher and lower ones. Mr. Coconut appears on the reels as a scatter but on any spin he may change his appearance for example donning a devil's outfit or some cool sunglasses, and throw extra coconuts onto the reels for scatter pays. You'll get at least 2 for 2x bet up to 100x bet if you get 5. They appear on the reels anyway, so may get one as a head start on a losing spin. There are Skull Wilds on all reels appearing singly with no multiplier, and 5 of these would pay 25x bet. We have 2 features to be triggered. On reels 2, 3 and 4 you may land 3 Ghost Train scatters to trigger a ride into the tunnel. 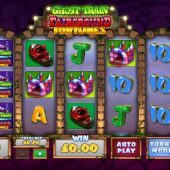 Each monster you pass along the way awards a cash prize and when it ends, you choose a ticket which may offer you another ride on the Ghost Train, up to a maximum of 5. Should you get the trigger with a Golden Ghost Train in it, you will be allowed at least 3 trips! On reels 1, 3 and 5 there lie free spin scatters represented by evil-looking bats. You will get 10 free games, you can retrigger them indefinitely and to boot your Wilds all become stacked 5-high on all the reels. Ah, did I forget? To make things more interesting, you also play these spins on an extra 30 paylines thus the game becomes a 50-line slot for the duration. This raises the maximum pay from 500x bet in the base game to 1250x bet - no bad thing!